In 1963, the Grammy Award for Album of the Year didn’t go to Elvis, Ray Charles, Bob Dylan, John Coltrane, Johnny Cash, or even The Beach Boys, though they all released albums during the qualifying year. Instead, it went to a comedy album called The First Family by a man you’ve probably never heard of: Vaughn Meader. It wasn’t just critical acclaim: The album reportedly sold 6.5 million copies in its first six weeks of release, the fastest-selling record of its time. Meader was wildly popular. He appeared on late night shows, made nightclub and radio appearances, gave interviews, performed at Carnegie Hall, rebuffed an invitation from Frank Sinatra to join the Rat Pack, and generally basked in the spotlight all while donning the persona of another man. But within a few years, Meader all but disappeared—because the man he was embodying was President John F. Kennedy. For years prior, Meader had been a piano-playing nightclub performer in New York with a musical comedy act. After Kennedy was elected, the Maine native found his calling in impersonating the President after tossing out a few lines onstage in Greenwich Village one night. It didn’t take much to tweak his own New England accent and transform into the young politician from Brookline, Mass. Meader went on to hold mock press conferences, relying partially on plants with setup questions and largely on his own skills as an improviser. While Jacqueline Kennedy was not too amused by the act, JFK himself reportedly played The First Family before a cabinet meeting, bought copies to give as Christmas gifts, and once opened a Democratic National Committee dinner with, “Vaughn Meader was busy tonight, so I came myself.” He was the right person at the right time, and the American people—already infatuated with the Kennedys—devoured the relatively good-humored jokes about the new First Family. 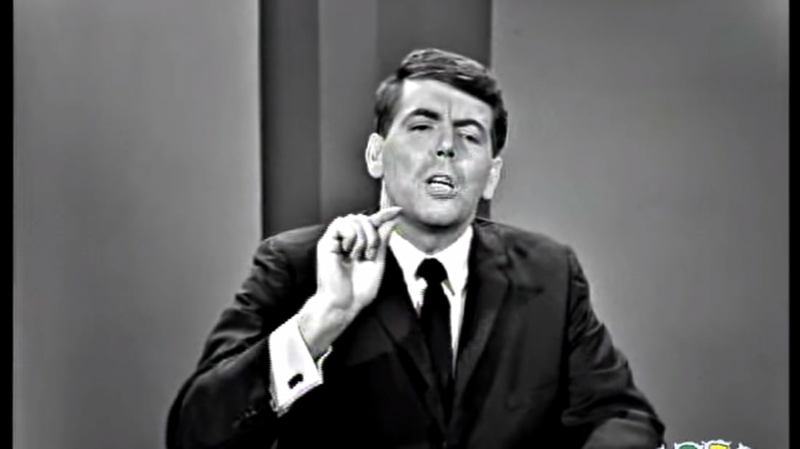 Watching him now (like on this appearance on The Ed Sullivan Show), the voice and gestures seem broad and obvious, but that’s because Meader set the standard by which all other JFK impersonations since have been based. He recorded The First Family the very same night as Kennedy’s Cuban Missile crisis speech (which the studio audience was blissfully unaware of), and he became a household name until November 1963, when Kennedy was assassinated and the country changed forever. As the story goes, on the day that Kennedy was killed, 27-year-old Meader hopped into a taxi at the Milwaukee airport at 1 p.m., just half an hour after the event. His driver asked, "Did you hear about Kennedy in Dallas?" Meader, who was oblivious to the news, readied himself for a joke and replied, "No, how does it go?" Then he heard the news on the radio. “It was character assassination," he later told the Washington Post 40 years later. "My character was assassinated. I got a bum rap." After that, Meader never did his Kennedy impression again, though people asked. His last television appearance was a painfully ill-received spot on The Ed Sullivan Show in 1964. No one wanted to see Meader as himself—he said people would approach him after the assassination and offer condolences as if he was a member of the family—and his new material simply didn’t stack up compared to the act that made him a star. In the following decades, Meader bounced around the country, tried out new routines, found alcohol and drugs, and then found God. He taught and played music, managed a pub, and was forever doomed to rely on the cultural phenomenon that brought him fame and fortune, while also distancing himself from it. He even reclaimed his given first name—Abbott (Vaughn was his middle name)—and put Vaughn Meader completely behind him. Near the end of his life, he sold the movie rights to his story to help with medical expenses—Bill Hader was reported to be playing the lead role, but the movie has yet to be made. A lifelong smoker, Meader died in 2004 at age 68 from chronic obstructive pulmonary disease. While inextricable ties to Kennedy ultimately doomed Meader’s career, he told the Los Angeles Times in 1997 that he had found happiness in life outside the limelight: “I'm better off than I've ever been," he said. "When I had the album, all those lowlifes around me who said they were friends, what I didn't realize was they were in it for the business. Now the funny thing is I'm a bum and I find people who really care. I have a wife who cares, friends who care. I look at Elizabeth Taylor at the Academy Awards or wherever, and I say, 'She any better off than me?' and I doubt she is."